This is the sixth episode of the Quimby's Bookstore Podcast, which features an interview with the charismatic, funny and thoughtful Caseen Gaines, the author of Inside Pee-wee's Playhouse: The Untold, Unauthorized, and Unpredictable Story of a Pop Phenomenon. Between 1986 and 1991, nearly ten million people a week watched Pee-wee’s Playhouse, the critically acclaimed and widely successful children’s program broadcast on CBS. Now, on the 25th anniversary of the show, the complete behind-the-scenes story is being told for the first time by those who experienced it. 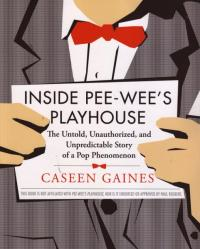 Complete with an episode guide, biographical information about the cast and key members of the show’s creative team, never-before-told anecdotes, and previously unpublished photos, Inside Pee-wee’s Playhouse takes the first in-depth look behind the program TV Guide recently cited as one of the top ten cult classics of all time. Here's a picture of Caseen at Quimby's! 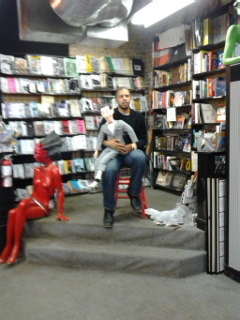 ...And of course... You can buy the book at Quimby's or order it from Quimby's here!